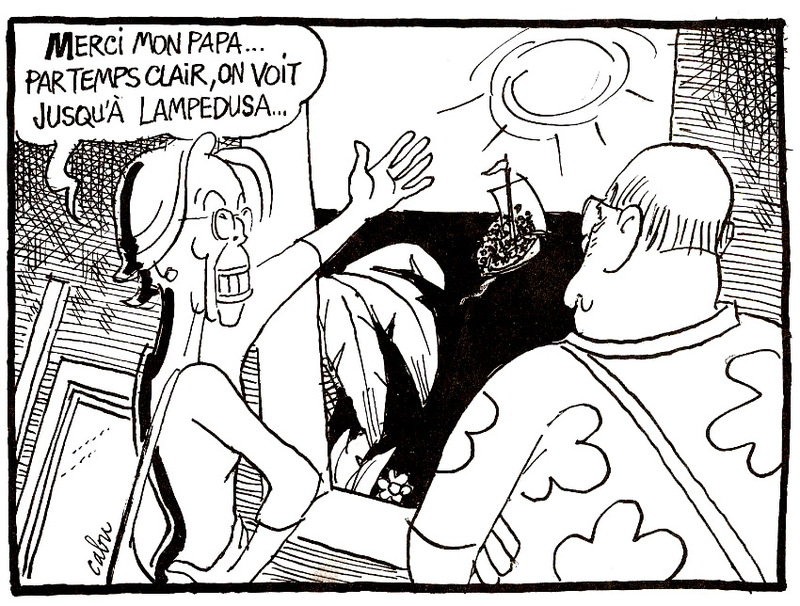 Michèle Alliot-Marie stands firm to the end: "I am still at my post! I'm just busy packing my boxes." 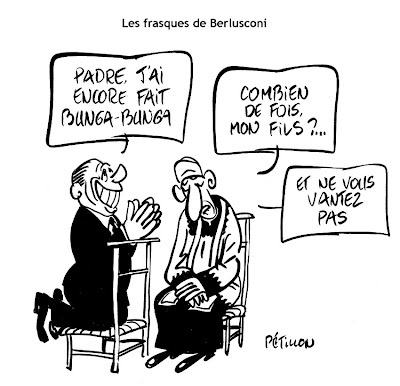 The former French foreign minister was forced to resign following revelations published in Le Canard that she had spent her Christmas holiday in Tunisia traveling around the country on a private jet owned by a business acquaintance of dictator Zine El Abidine Ben Ali. 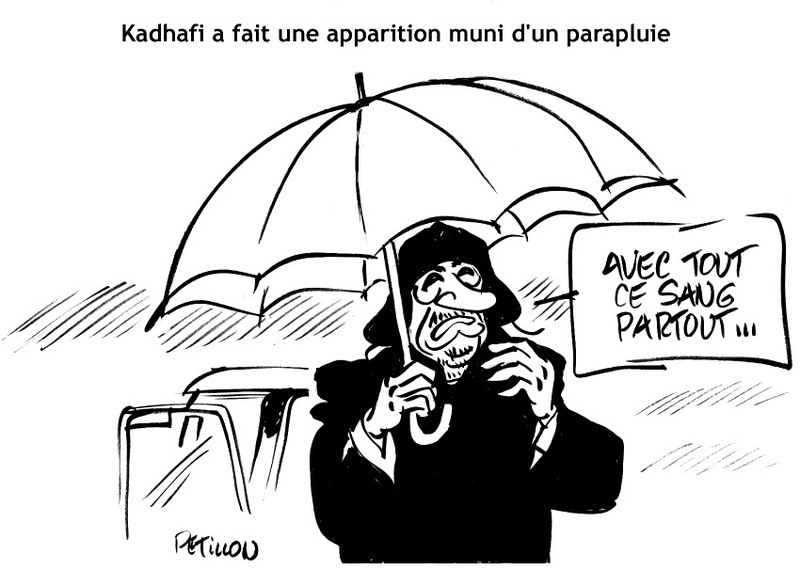 The paper reported that, after returning to Paris, she had offered the dictator police support and French tear gas to deal with the protests washing over his country. 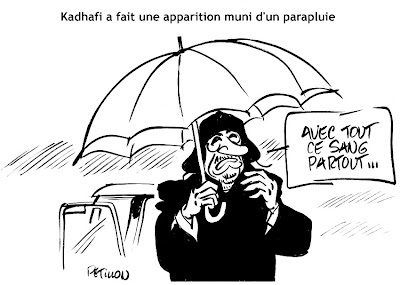 Gadhafi made an appearance with an umbrella: "With blood all over everything." 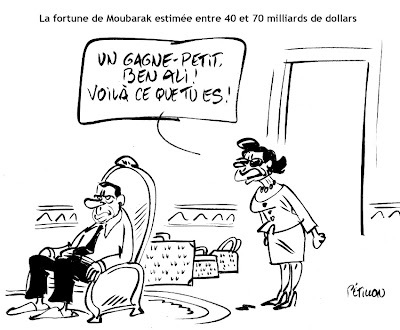 Mubarak's fortune is estimated at between $40 billion and $70 billion: "A weak earner, Ben Ali! That is all you are!" The ex-Tunisian dictator Zine El Abidine Ben Ali likewise amassed a sizeable fortune during his decades of leadership. "Thanks dad... on a clear day, you can see Lampedusa..." This cartoon is an ironic take on the flood of refugees unleashed by the unrest in North Africa and a barb at Former French Foreign Minister Michèle Alliot-Marie, who was forced to resign after a Christmas trip to Tunisia, during which she and her family were flown around the country in the private jet of a friend of Tunisian dictator Zine El Abidine Ben Ali. While there, Alliot-Marie's parents bought part of a real-estate company from a Ben Ali business associate. The French Patrol or the "The Wrong Stuff." 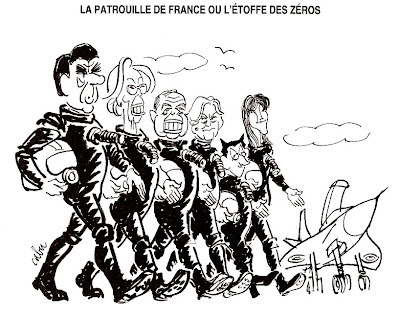 The caption is a play on the French name for the film "The Right Stuff" and shows Sarkozy, his wife Carla Bruni and leading French politicians. 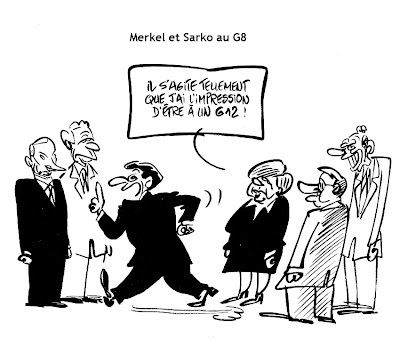 Iran announces the suspension of stoning: "If one day it becomes an Olympic discipline, we will miss out on practice..."
Merkel and Sarko at the G-8: "He moves about so much that I have the impression of being at a G-12!" The joke is a play on Sarkozy's reputation for being hyperactive on the international stage. The escapades of Berlusconi: "Father, I have done Bunga Bunga" "How many times, my son?... And don't exaggerate." 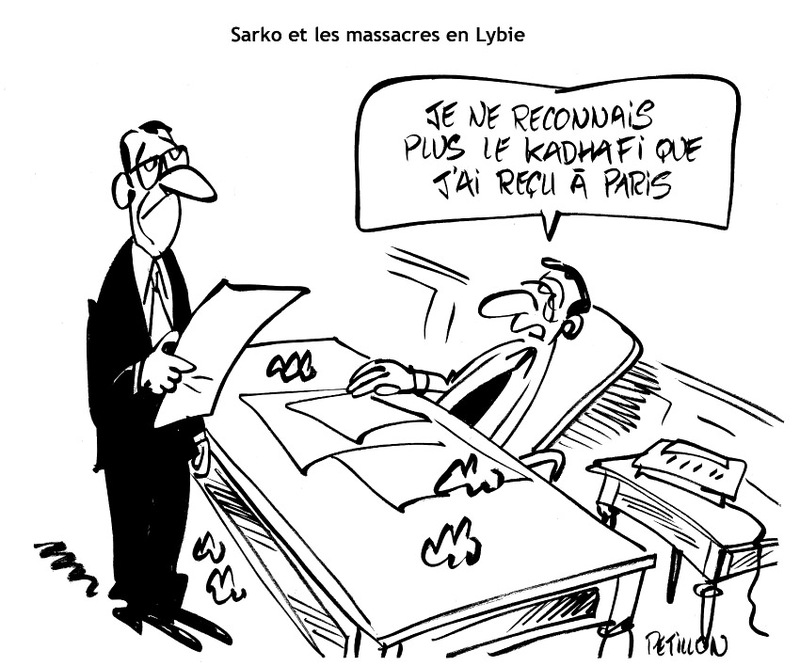 Le Canard thrives on political scandals, both in France and elsewhere. Sarkozy's friend: "My relationship with Merkel is excellent" "Uh... that's not what she says..." "She is wrong!" 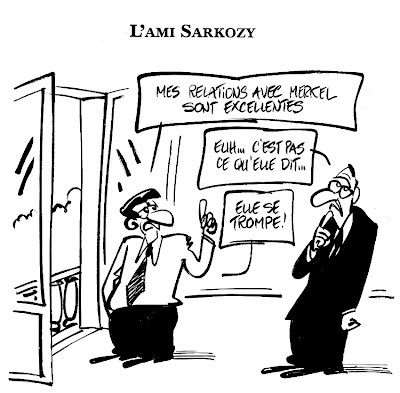 The joke refers to the often rocky relationship between the French president and the German chancellor.